Pssst…Fall is fast approaching, can you tell? It’s true. Hide ya kids, hide ya wives, because I’ve been hit with the fall flavor bug too. I’m obsessively bookmarking grain-free “Baking – Fall Edition” boards on Pinterest and planning out all the delicious pumpkin-y, cinnamon-y, paleo desserts I’m going to dream up and bake by the time the Thanksgiving holiday hits. Did you know I’ve been promising to make grain/dairy-free cinnamon rolls for the past three years now? This is the year folks. This.is.the.year. Until then, I promise not to crowd your inbox or newsfeed with a bunch of been-there, done-that pumpkin recipes…err, okay….maybe just one or two, but that’s it! Today, however, I’m really excited to share one my favorite fall recipes that IS NOT a baked good. Shocker! 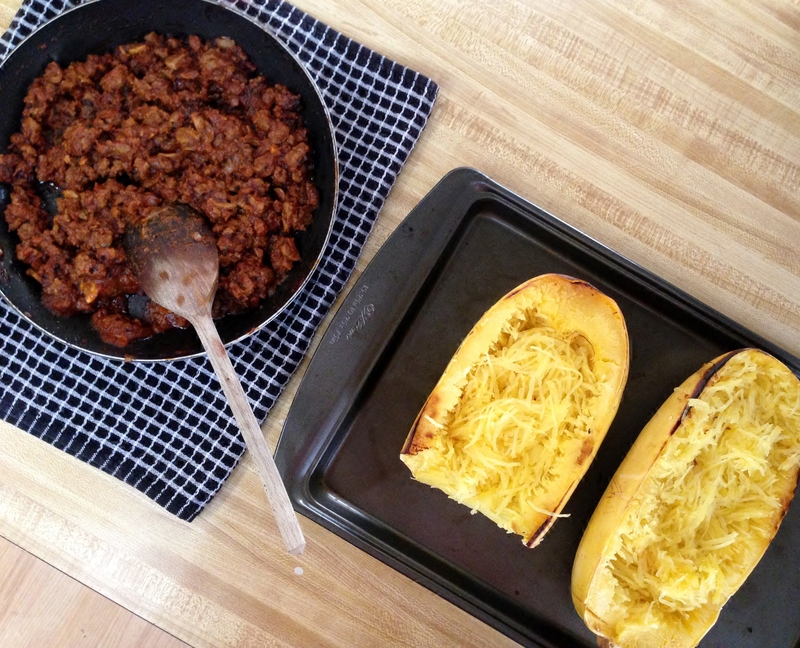 If you’re missing spaghetti from your pre-Paleo days, or just want to feel warm and cozy on a chilly fall evening, you have to try my recipe for stuffed spaghetti squash boats. We’re talking warm, hearty comfort food that is 100% grain-free, easy on the waste line, and so insanely delicious, you’ll be setting aside those pumpkin treats for some real food. Preheat the oven to 400 degrees. 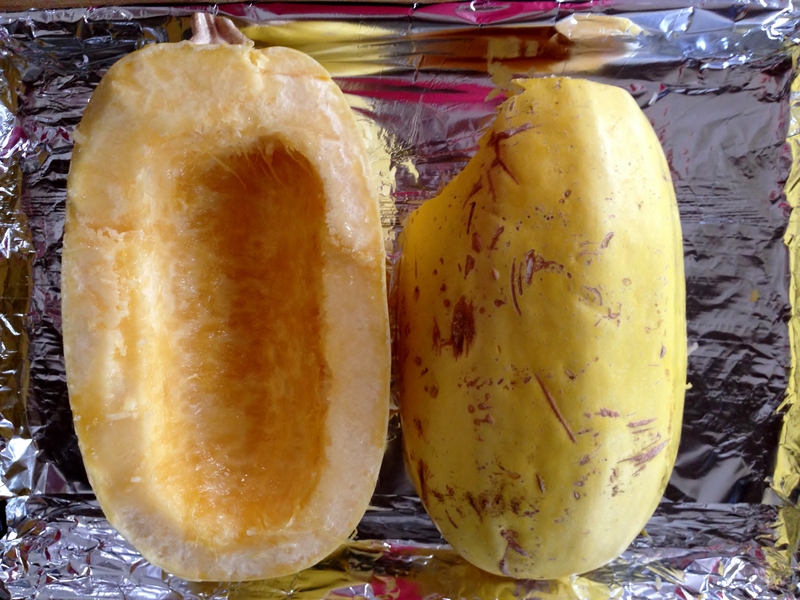 Using a sharp knife, cut the spaghetti squash in half, lengthwise, and spoon out the “guts” and seeds. Place them face up on a baking sheet, drizzle 1 tablespoon of coconut oil on each half, and let sit for a minute for the oil to harden. Then, flip the squash “boats” upside down on the baking sheet (cut side down), and bake for 30-40 minutes, until soft. While the squash is baking, heat the remaining teaspoon of coconut oil in a skillet, and add the diced onions and garlic. 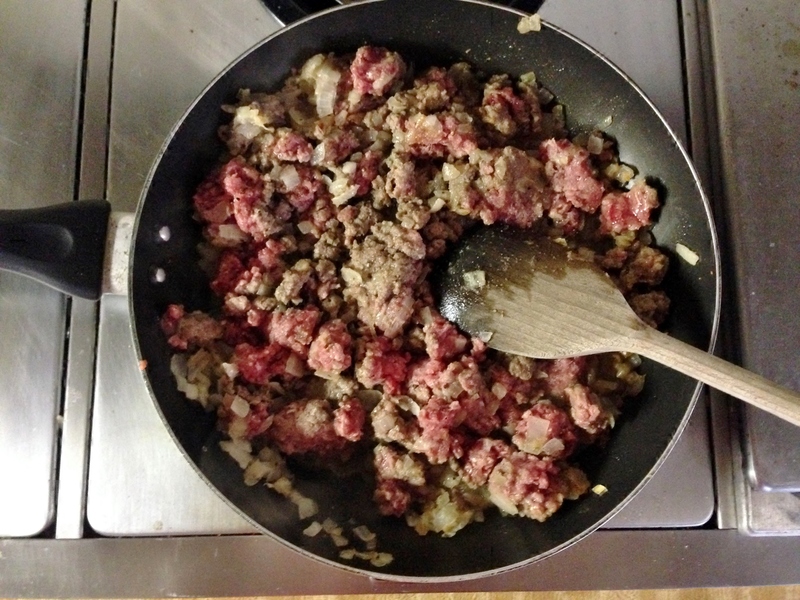 When the onions are translucent, add the ground beef, salt-n-pepper, and cook on medium heat until the ground beef is browned. 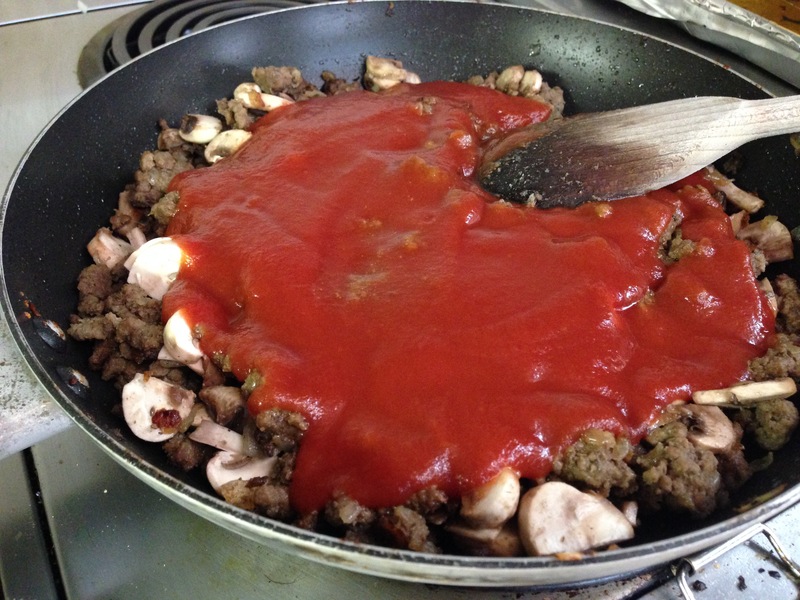 Once the beef is browned, remove from heat, cover and set aside while you prepare the tomato sauce. To make a quick and tasty tomato sauce, take the can of diced tomatoes and can of tomato paste and blend in a food processor or small blender until smooth. Add the sauce to the ground beef, along with the mushrooms and herbs, cover and cook on low-medium heat for about 10-15 minutes. When your spaghetti squash is out of the oven, flip the boats over and use two forks to shred the squash into spaghetti-like strands. For presentation and durability purposes, you might want to leave a layer of squash un-shredded on the sides of the boats. You can shred the squash and leave in the boats, or remove the shredded squash and set aside in a bowl to stuff as you please later. Once you’re ready to stuff the boats with the squash and meat sauce, add the removed squash back into the boats (if you chose to remove), and “fluff” the mixture with a fork to get a nice, even layer. 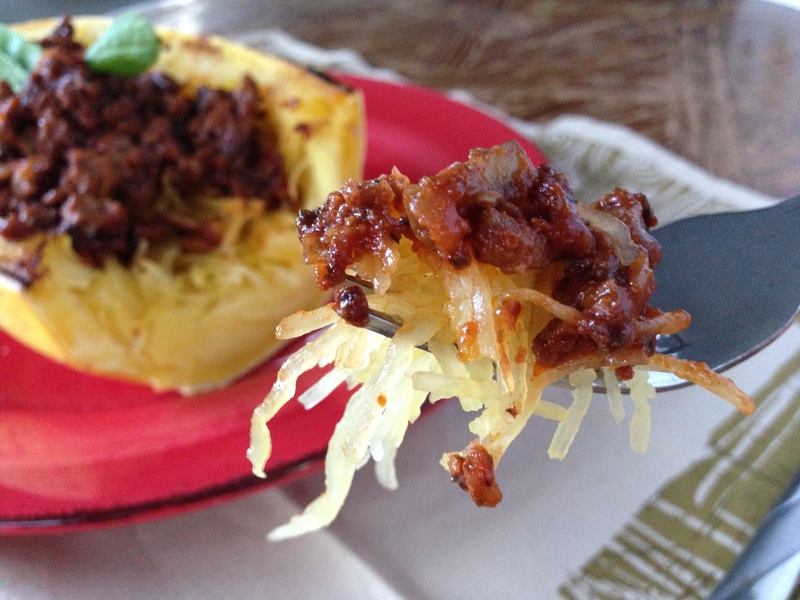 Gently spoon the meat sauce over the spaghetti squash to fill each boat. Garnish each boat with fresh basil and serve, for a satisfying meal with plenty of leftovers. 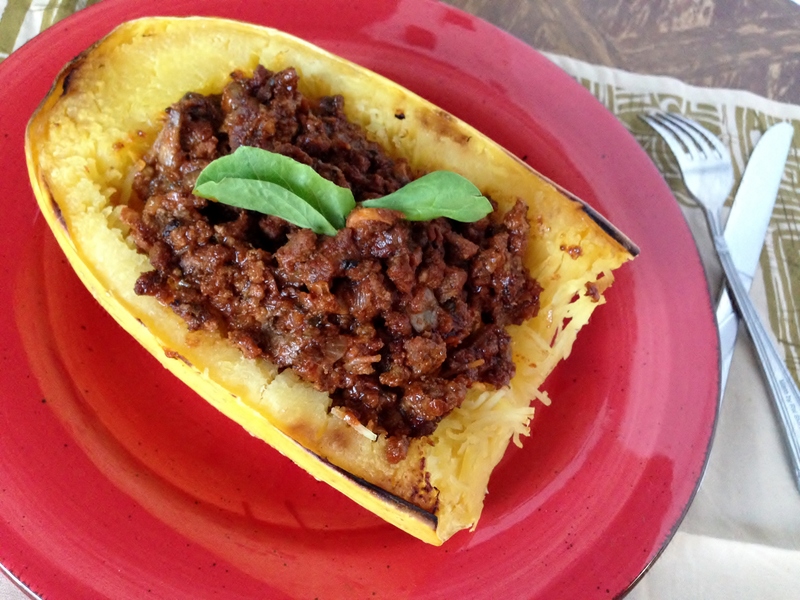 *Note, I had a good size squash, so I was able to fill each boat completely without any leftover meat sauce. 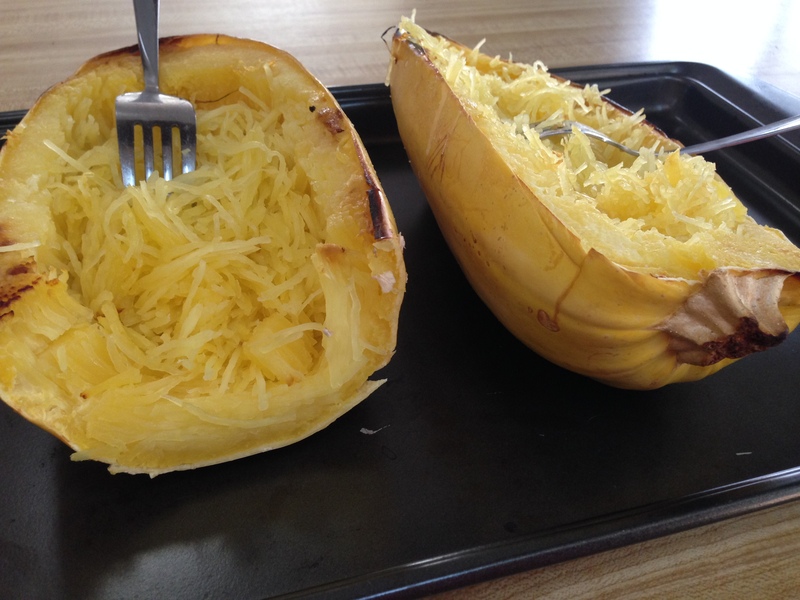 This recipe makes 2 spaghetti squash ‘boats’. The nutrition facts below have been calculated using a serving size of half of each ‘boat’. If you are following a meal plan, please adjust your servings to fit your meal plan as needed. Alrighty everyone, back to Pinterest. If you’re looking for me….